The past week or so has seen the U.S. send a number of nuclear warnings to Russia in Europe. Last week, the U.S. Air Force (USAF) announced it was temporarily deploying three B-52 nuclear-capable bombers. Then, this week, the USAF announced it was sending two additional B-2 nuclear-capable stealth bombers to Europe. Both deployments were portrayed as routine training exercises. Given the crisis in the Ukraine, and Russia’s stepped up nuclear training, it would be foolish to accept the USAF at its word. The Ukraine crisis is more likely the latest example of the U.S. bomber fleet’s utility to America’s extended deterrence mission. Last year, during one of North Korea’s epic temper tantrums, the U.S. also deployed B-52s to South Korea for “training purposes,” followed by a flyover by a pair of B-2 stealth bombers. The purpose of the fly-over mission, according to U.S. military officials at least, was to demonstrate “the United States’ ability to conduct long range, precision strikes quickly and at will.” Similarly, last November the U.S. used a pair of B-52s to challenge China’s newly announced Air Defense Identification Zone (ADIZ) in the East China Sea. A new report by the Congressional Research Service (CRS) argues that the aging bombers’ ability to carry out this mission is waning. It notes that 21st century adversaries’ growing anti-access/area-denial capabilities threatens to undermine existing bombers’ ability to reach their targets. “As potential adversaries acquire 21st century defense systems designed to prevent U.S. access to the global commons (sea, air, space, and cyberspace) and to limit U.S. forces’ freedom of action within an operational area, the ability of these Cold War era bombers to get close enough to targets to be effective will continue to deteriorate,” the CRS report, written by Jeremiah Gertler, states. As the report notes, the USAF ultimately intends to deal with this situation by procuring a new Long Range Strike Bomber (LRS-B). The next generation LRS-B, however, is not scheduled to gain initial operation capability until near 2030. If procurement history is any guide, we shouldn’t expect these new bombers to join the service until much later. The problem, as is often the case, is cost. The U.S. currently maintains a bomber fleet of 76 B-52H bombers, 63 supersonic B-1B bombers, and 20 B-2 stealth bombers. 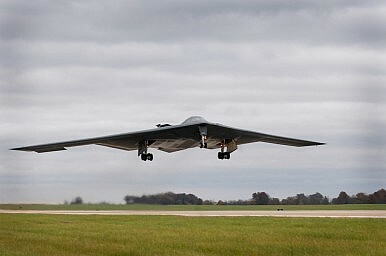 According to a chart in the CRS report, the military intends to spend around $2.5 billion-$3 billion annually between now and FY 2022 to maintain and modernize the existing bomber fleet, as well as invest in the new LRS-B. Already, “from FY2002 through FY2012, the sustainment and modernization appropriations for the B-52, B-1, and B-2 averaged $160.15 million, $219.77 million, and $451.2 million per year respectively.” In the FY 2013 budget, however, funding for the B-52 and B-1 was down 61 percent and 24 percent respectively from the previous 11-year average. Thus, the U.S. Air Force faces difficult choices in the years ahead. However, it should be recognized that these choices should be made almost entirely based on the bombers’ conventional missions. Indeed, so far as their potential nuclear missions are concerned, adversaries’ A2/AD capabilities are almost completely irrelevant. That’s because the bomber fleet’s nuclear missions do not actually include dropping nuclear bombs on enemies. Instead, its main utility for America’s nuclear deterrent — including extended deterrent — is to signal to adversaries and reassure allies. As seen in Europe today and North Korea last year, America can send its nuclear-capable bombers abroad to signal to adversaries and allies alike. Because of their visibility, bombers are able to achieve this in a way that ICBMs located in the United States and ballistic missile submarines (SSBNs) cannot. This is an incredibly important mission; in fact, unless something goes terribly wrong, this is the only nuclear mission the U.S. will ever have to carry out. However, if deterrence ever did fail and the U.S. had to carry out a nuclear strike, it would almost certainly not rely on its bomber fleets to do so. America’s ICBMs would be the most likely leg of the triad to be used given their combination of accuracy and ability to penetrate enemy defenses. Some would argue that the bomber fleet serves another important deterrent mission — namely, survivability. Unlike the ICBM force, which is located at fixed targets and could theoretically be destroyed in a first strike by an adversary, the bombers can be moved around and kept in flight to prevent them from being eliminated. This argument is unconvincing. In the extremely improbable event that an adversary’s first strike destroys all of America’s ICBMs, the U.S. would almost certainly respond with its submarine launched ballistic missiles (SLBMs). The U.S. currently operates a total of 14 Ohio-class SSBNs, and will continue to do so until at least the end of the 2020s when the replacement for the Ohio-class SSBNs (of which there will be 12) enters into service. In 2012, the at-sea rate (the average number of SSBNs on patrol at any one time) for these SSBNs was 8. As Hans Kristensen notes, “The eight SSBNs that are currently at sea carry 192 missiles with an estimated 860 warheads.” Not only is it extremely unlikely that an adversary would wipe out America’s ICBM force in a first strike, but even if this did occur America’s SSBN would be more than adequate in retaliating. Therefore, in deciding on the level of funding necessary to modernize the existing bomber fleet to overcome A2/AD challenges, Congress should focus only on the military’s conventional bomber needs. Calls for the retirement of America’s nuclear-capable bombers make little strategic sense.